Sony launches new 4K TVs, Blu-ray players, soundbars for 2014 | What Hi-Fi? There was no shortage of announcements from Sony during its CES 2014 press conference. The big push was for Ultra HD 4K televisions, with three new ranges of 4K TV and seven new models in total. The new products were joined by news of a Sony Netflix 4K collaboration, which aims to help fill the 4K content gap. Some feature a new "wedge" design, such as the 65in KD-65X9005 (£tbc, due Spring 2014, pictured above). 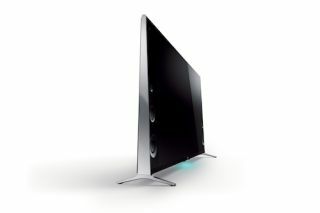 The TV also includes HDMI 2.0 connectivity, Sony's Triluminos Display technology and Sony's 4K X-Reality PRO picture processing engine. We'll bring you the full rundown of Sony's 2014 TV range, including its all-new Full HD models, shortly. There's also four new Blu-ray players to look forward to, including the BDP-S6200 (£200, pictured). Features for this machine include Ultra HD 4K upscaling, a dual-core processor, advanced picture processing and a digital music enhancer. The other models in the range are the BDP-S5200, BDP-S4200 and BDP-S1200 and all are due for launch in February. Soundbars and soundbases are hugely popular and Sony has options in both camps, including the HT-XT1 Speaker Base (pictured above, £299, due April 2014). Sony recommends it to be used with any TV under 50in, with your set connecting via HDMI. The Sony also features 170W of amplification and 2.1 virtual surround sound. The HT-CT770 (pictured above, £450, due May 2014) soundbar is an intriguing angled design. It features 330W power output, high-def audio decoding, Bluetooth and NFC connectivity. Its more affordable sibling, the HT-CT370, is a smaller unit with 300W of power.